Viacom (NYSE:VIA) announced mixed Q3 results on August 9, as its earnings per share came in ahead of market expectations but revenues missed. The company’s total revenue decreased 4% year-over-year (y-o-y) to $3.2 billion, due to declines in both the Media Networks and Filmed Entertainment segments. The company’s top line fall was driven by a decline in affiliate (-4% y-o-y) and advertising (-3% y-o-y) revenues at the Media Networks business, along with soft results in the theatrical business due to a weaker film sate at Paramount studio. At Filmed Entertainment, an overall 20% y-o-y gain in domestic revenues was driven by A Quiet Place and Book Club. However, this was more than offset by a 33% y-o-y decline in international revenues, due to a difficult y-o-y comparison to last year’s Transformers: The Last Knight and Ghost in the Shell. Viacom’s adjusted operating income declined 8% y-o-y, driven by the decrease in revenue, investments in original programming and costs related to growth initiatives, which were partially offset by the benefits from its cost transformation. The company also posted adjusted earnings of $1.18 per share, slightly up y-o-y, largely due to tax reform. Viacom’s stock price increased over 5% after the Q3 earnings announcement, primarily due to results at Paramount that declined less than expected. Our $34 price estimate for Viacom’s stock is now slightly below the current market price. We have created an interactive dashboard on what to expect from Viacom’s 2018 earnings which outlines our forecasts for the company’s Q4 results. You can modify our forecasts to see the impact any changes would have on the company’s earnings and valuation. We expect Viacom to continue to post an increase in earnings and revenue growth rate in Q4, driven by growth in affiliate revenues and savings from its cost transformation, partially offset by a soft quarter at Paramount. 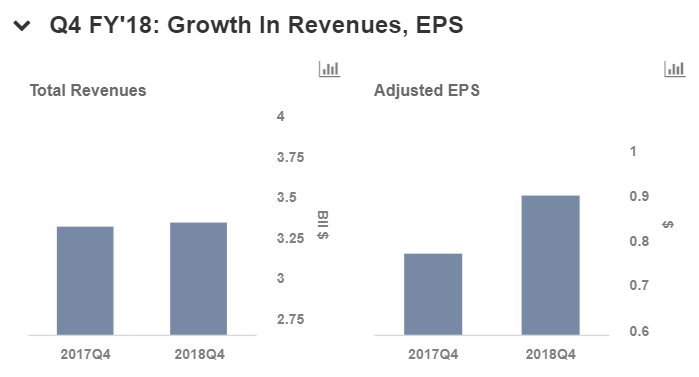 In Q4, Viacom anticipates year-over-year growth in total company revenue, adjusted operating income and mid to high-teens growth in adjusted diluted EPS. Viacom expects the domestic and international affiliate revenues to return to growth, driven by the lapping of rate resets, timing of the SVOD revenue, as well as the benefit from its reinstated carriage on Charter and Suddenlink. The company expects its ratings to improve on the back of new original programming coming on air, greater carriage benefits from improved distributor penetration and accelerating contributions from digital initiatives. However, the company expects its international advertising revenues to decline, driven by continued negative currency impacts. In addition, the company anticipates taking a charge of approximately $20 million in the fourth quarter, principally related to the third party professional fees. For fiscal 2018, Viacom continues to expect double-digit growth in international affiliate revenue. It also expects programming expense to be flat versus the prior year, as the company is investing in original programming at its flagship networks while benefiting from the mix shift to unscripted programming. In terms of costs base reinvention, the company is on track with the fiscal year 2018 savings of over $100 million and continue to expect to achieve more than $300 million in run rate savings in 2019 and beyond. These savings are expected to largely drop to the bottom line. For fiscal 2019, the company continues to expect growth in domestic affiliate revenues helped by rate escalators, sustained vMVPD growth, including the launch of new vMVPD services from traditional distributors and revenue from mobile. Paramount’s 2019 slate will nearly double the number of releases as compared to the 2018 slate, which will impact the working capital and would be incurred in fiscal 2018.